34 / the tasting panel / april 2015 CHAMPAGNE I n some circles, half a century old might not be consid- ered young, but having just celebrated its 50th year of production, Champagne Jacquart is one of the youngest Champagne houses of the region. Champagne Jacquart was born in 1964 out of an alliance of growers committed to typicity, honesty and excellence in their vineyards. With 6,000 total acres in their alliance of growers to choose from, Champagne Jacquart is made from only Grand Cru and Premier Cru vineyards from the best 500 acres. With winemaker Floriane Eznack at the helm, Champagne Jacquart has created a line of wines with a sensibility that seems way older and wiser than one would expect from this "fledgling" house. 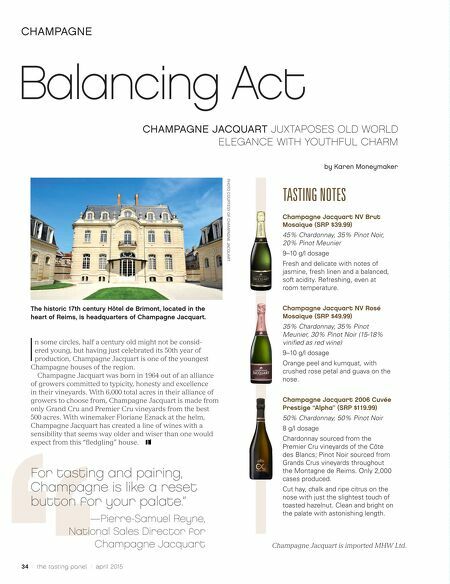 Balancing Act CHAMPAGNE JACQUART JUXTAPOSES OLD WORLD ELEGANCE WITH YOUTHFUL CHARM by Karen Moneymaker The historic 17th century Hôtel de Brimont, located in the heart of Reims, is headquarters of Champagne Jacquart. PHOTO COURTESY OF CHAMPAGNE JACQUART Champagne Jacquart is imported MHW Ltd. For tasting and pairing, Champagne is like a reset button for your palate." —Pierre-Samuel Reyne, National Sales Director for Champagne Jacquart TASTING NOTES Champagne Jacquart NV Brut Mosaique (SRP $39.99) 45% Chardonnay, 35% Pinot Noir, 20% Pinot Meunier 9–10 g/l dosage Fresh and delicate with notes of jasmine, fresh linen and a balanced, soft acidity. Refreshing, even at room temperature. Champagne Jacquart NV Rosé Mosaique (SRP $49.99) 35% Chardonnay, 35% Pinot Meunier, 30% Pinot Noir (15-18% vinified as red wine) 9–10 g/l dosage Orange peel and kumquat, with crushed rose petal and guava on the nose. Champagne Jacquart 2006 Cuvée Prestige "Alpha" (SRP $119.99) 50% Chardonnay, 50% Pinot Noir 8 g/l dosage Chardonnay sourced from the Premier Cru vineyards of the Côte des Blancs; Pinot Noir sourced from Grands Crus vineyards throughout the Montagne de Reims. Only 2,000 cases produced. Cut hay, chalk and ripe citrus on the nose with just the slightest touch of toasted hazelnut. 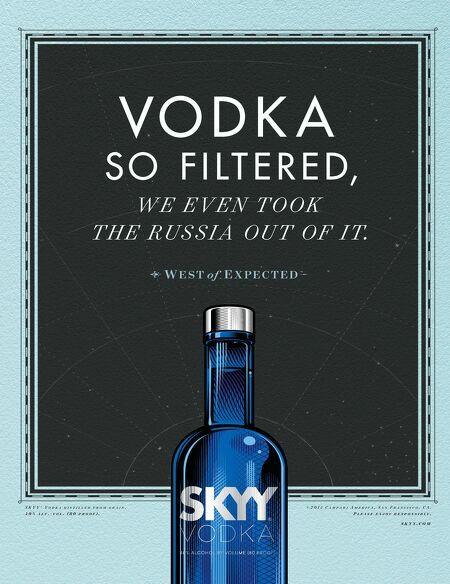 Clean and bright on the palate with astonishing length.